This personalized memorial glass candle holder will be treasured by family and friends For years to come. 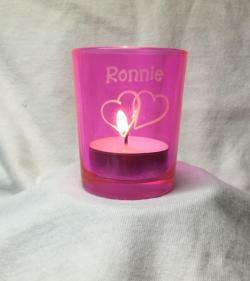 Each votive is custom engraved with a state of the art laser engraver. Each piece is unique and lovingly created just for you. The dimensions are approximately 2" diameter X 2.5 high. This item will be permanently engraved with 2 hearts entwined and your angels name. The tea light candle is included.